So, how do you celebrate a cold Christmas when you're all alone for the winter break and your flatmates are gone to sunny California? Eat a lot of pie and watch F.R.I.E.N.D.S. 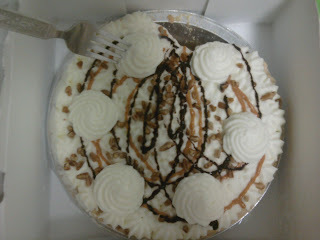 This french pecan silk pie was killer. Had a ton of whipped cream on it. Also, as you may already know that I live in the land of obesity. That reminds me I gotta do some ab crunches next morning.